Breadshare is a non-profit-distributing social enterprise based in Portobello, Edinburgh. Our mission of Real Bread for Everyone means we serve and involve the community by making excellent, nutritious bread using organic ingredients and local products, helping to create a more sustainable and health-enhancing food system. We aim to make real bread more accessible and to tell people about why this type of bread is better. That’s why you will see us at local markets and making bread in our bakery with lots of different groups of people. Breadshare bakery was established in the Scottish Borders and commenced baking in January 2012 with a team of three people in the bakery. We moved our bakery operations to Edinburgh in 2015 where we now have a cafe and bakery in Portobello and a shop in Leith. 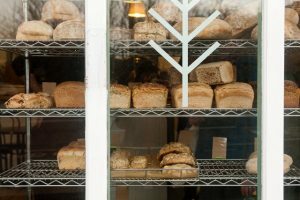 As a social enterprise, Breadshare is committed to increasing the accessibility of better bread to the community and supporting local food systems. Breadshare is a Community Interest Company (CIC) limited by guarantee, incorporated in Scotland.